Gluten free pumpkin pie - Cooking @ planetfem - recipes, advice, good food and more! Gluten sensitivity or intolerance is a condition that causes a person to react after ingesting gluten, a protein found in wheat, barley and rye. Symptoms vary widely and can include gastrointestinal problems, joint pain, fatigue and depression. It’s a festive period and food has the main role in enjoying it to the fullest. What if you are gluten intolerant? Have a look at Jamie Oliver website, there are many gluten- free recipes. Pick one and for sure that you’ll suffer none of the above symptoms. I chose “Gluten free pumpkin pie”. It has many healthy components which will make it delicious as well. Preheat the oven to 350°F. Lightly grease a 10-inch non-stick loose-bottomedtart pan with vegetable oil. Halve the pumpkin, scoop out and discard the seeds, then roughly chop into large wedges (there’s no need to peel it). Spread out in a roasting pan, cover with tin foil, then put in the oven for around 1 hour, or until tender, removing the foil for the final 10 minutes. Meanwhile, make the pastry. Sieve the flour and xanthan gum from a height into a large bowl, then stir in the sugar and cinnamon. Chop the butter into cubes, then use your fingertips to rub it into the flour mixture until it resembles fine breadcrumbs. Beat the egg in a separate bowl, then add to the mixture. Use your hands to bring it together into a rough dough, adding a good splash of milk (if needed), but don’t overwork it too much at this stage. Pat the dough into a flat round, roughly 1 inch thick, wrap in plastic wrap and place in the fridge to rest for at least 30 minutes. Once tender, remove the pumpkin from the oven and leave to cool. Roll out the pastry to roughly ¼ inch thick (if you find it crumbles too much, roll it out between two large pieces of plastic wrap). Carefully place the dough into the prepared tart pan, gently pressing it into the sides. Trim away any overhanging pastry, prick the base with a fork, then place in the fridge to chill for another 10 minutes. Place a layer of plastic wrap into the chilled tart case, fill with uncooked beans or rice, then put in the oven to blind bake for 10 to 12 minutes. Remove the plastic wrap and beans or rice, then cook for a further 5 minutes, or until golden. Remove from the oven and allow to cool completely. Meanwhile, scoop the cooled pumpkin flesh into a food processor, discarding the skin, then blitz until smooth. Melt the butter in a small pan over a low heat for 1 to 2 minutes, or until dark and frothy. Add the brown butter to the blitzed pumpkin with the sugar, flour, nutmeg, ½ teaspoon of cinnamon and the vanilla extract. Whisk 2 eggs in a separate bowl, add to the processor, then blitz again until well combined. Transfer the mixture to the cooled pastry case, using a fork or spoon to spread it out evenly. Roll out the leftover pastry to roughly ¼ inch thick, then cut it into long strips, roughly ½ inch wide. 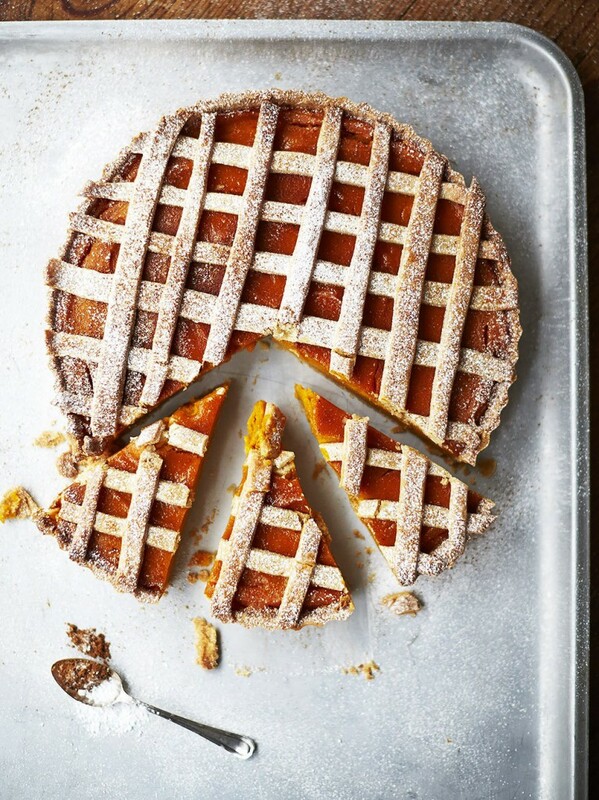 Place on top of the pie, crisscrossing them as you go to create a nice lattice, then trim away any rough edges. Beat the remaining egg and brush over the pastry. Place the pie in the hot oven for 45 to 50 minutes, or until golden. Dust with confectioner’s sugar and cinnamon, then serve.